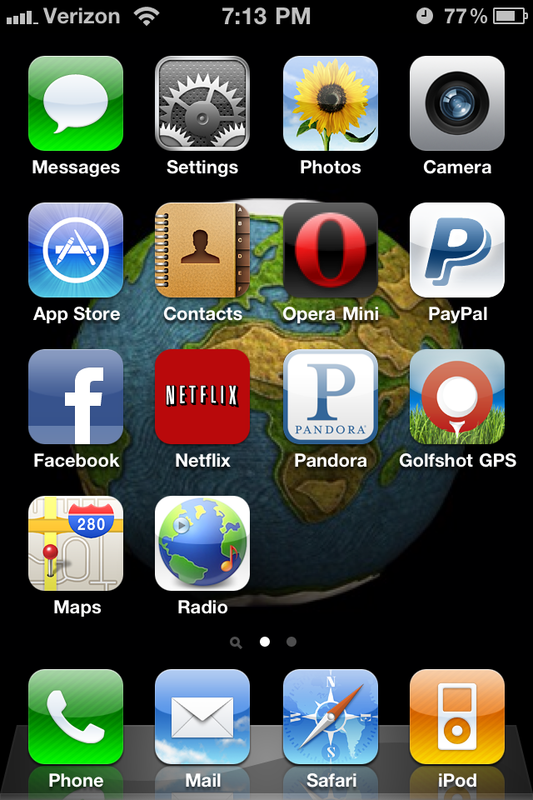 In March, I finally made a move that I had been wanting to for a long time and picked up a Verizon iPhone 4. It didn’t take me long to start shopping for a golf GPS app, as I was curious to see what this device was really capable of. There were many to choose from. After a little research, I narrowed it down to one called GolfShot GPS ($29.99). GolfShot’s website was very helpful in answering all of the questions I had. I was most worried about the speed of getting a yardage and how accurate the yardages were. I spent a lot of time reading reviews about this app as I didn’t want to drop $30 on something that was slow or that wasn’t accurate. Overall the reviews of this app are very positive. I’d like to give my own short review, as I have used this app for more than 20 round of golf now. Please keep in mind that I rarely do reviews on any products (but I will be doing more! ), so this is still a little foreign to me. I’ll do my best to cover all bases with an unbiased opinion. I purchased this app literally hours before my first real round of the 2011 season. I was very anxious to put it to use. As soon as I got to the parking lot at the course, I opened up the app and it was quickly giving me a list of courses, sorted by nearest first. I picked my course, picked my tee box, added myself and the players in my group, and I was off and running. All of these pages were easy to navigate and everything was very pleasing to the eye. It was very simple to add in new players to your group along with information about them (e-mail address for example, so you can share the scorecard after the round with them). At this point I was already in love and I hadn’t even started using it for it’s main purpose yet: yardages and course management. Seeing that I take this game of golf fairly serious, and am able to hit my yardages pretty accurate each time, I was a little hesitant to trust the yardages without still checking them against sprinkler heads and my friends’ rangefinders. I did several comparisons by standing on marked yardages (a 150 yard marker for example) and checking the app. 99% of the time it was within one or two yards. 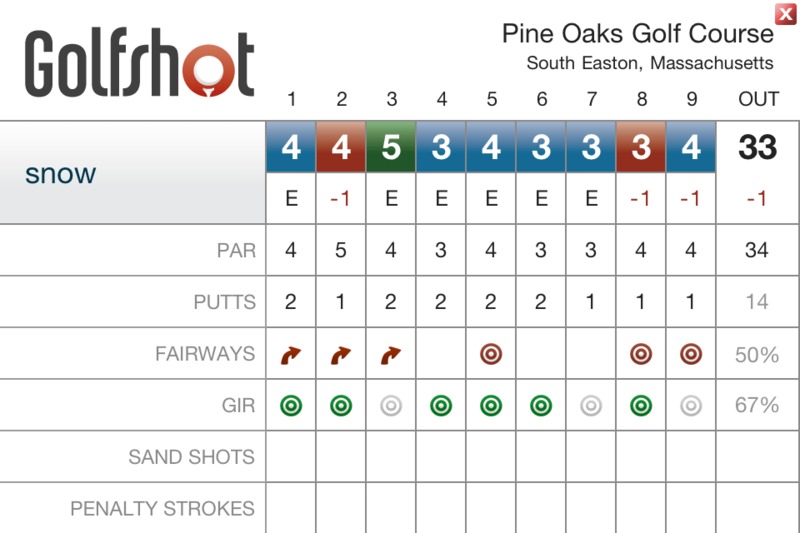 This was good enough for me and I quickly began to trust the yardages more and more as my first few rounds went on. 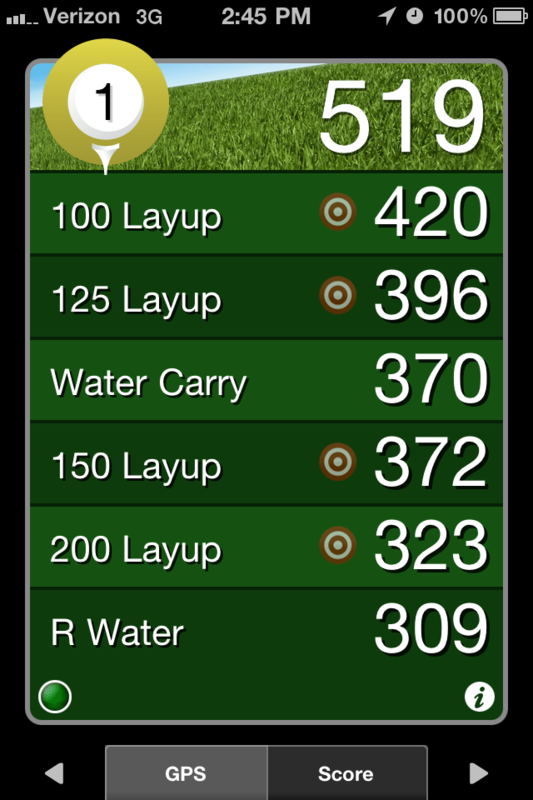 Most of the time I only use the app for getting the yardage to the center of the green (the main/larger font number that appears), but it also shows various distances to different points on the hole, such as 100 yard layup, front edge, water carry, etc. Even though I don’t use these too often, they come in very handy when they are needed. You can also switch to an aerial view and see what the hole looks like. Also in this view you can move the “cursor” around on the screen to get specific distances to area of your choice….the treeline or the dogleg for example. I don’t use this feature too much, but when I have it has been helpful and accurate. One of the bigger concerns that seem to be brought up in GPS reviews, is the amount of time it takes to get an accurate yardage once you arrive at your ball. From what I’ve seen, as long as you have the app open, and “wake” your phone as you approach your ball, it gives you an accurate yardage within 5 – 15 seconds of arriving. This should be quick enough for most people to avoid slowing down the pace of play, which is always a concern when someone is using a GPS for most every full shot during the round. I can only give my review of this app when being used on the iPhone 4. From what I have heard, the battery life is shorter when used on an iPhone 3G, for example. For mine, after charging the phone to a full 100% and arriving at the course with at least 95% remaining, I have never seen the battery drop below 50%, most of the time being between 60% and 70% at the end of the round. I definitely don’t use the app on every shot as some people will, but I feel that I use it plenty and the battery life results were very pleasing to see. 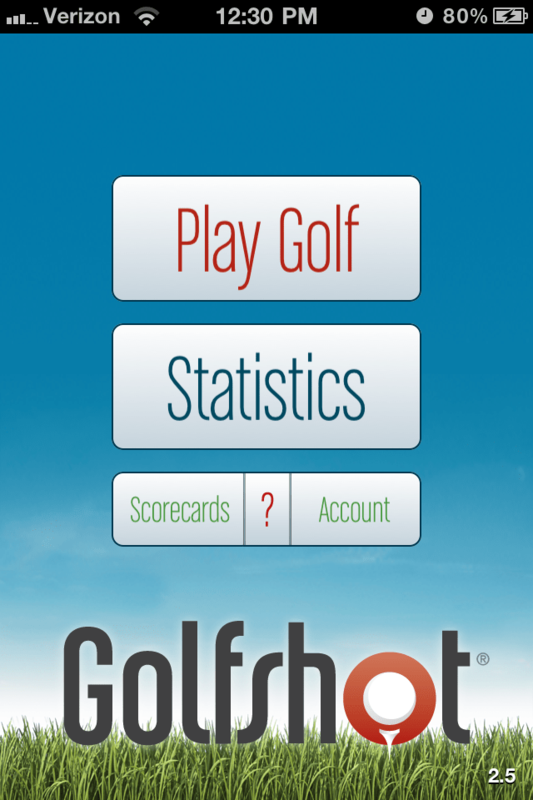 A word of advice, leave the GolfShot app open at all times, simply put the phone to sleep to save battery life. Awake the phone/app as you approach your ball. This will save a lot of battery life and help keep your pace of play up. One thing about this app that I was not initially excited about was the scoretracking and the statistics that are provided as you save your scorecards. This quickly changed after my first round. 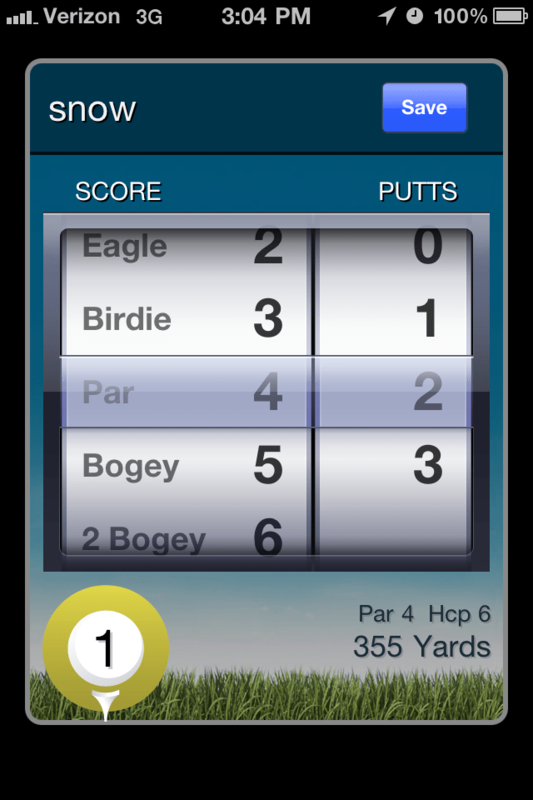 After each hole is completed, you have the option to choose your score on that hole along with the number of putts. The next screen lets your choose what club you used on the tee, what you did off the tee (fairway hit, miss left, miss right, miss long, or miss short), sand shots, and penalty strokes. Inputting all of this information allows the app to determine a number of things, most importantly (to me) the number of putts, fairway hit %, greens in regulation %, and scrambling %. When you finish a round, you have the option to save the scorecard, share it on Facebook or Twitter, e-mail, or discard it. Once saved, the scorecard gets e-mail to you (and anyone else that you choose). The scorecard has stats for that round, which is usually indicative of what your actual score was. You can also go back and look at previous rounds. This information is stored and presented beautifully on the GolfShot website. The website has a sections dedicated to a profile, equipment, swing videos (in combination with the Tiger Woods My Swing app), and friends. 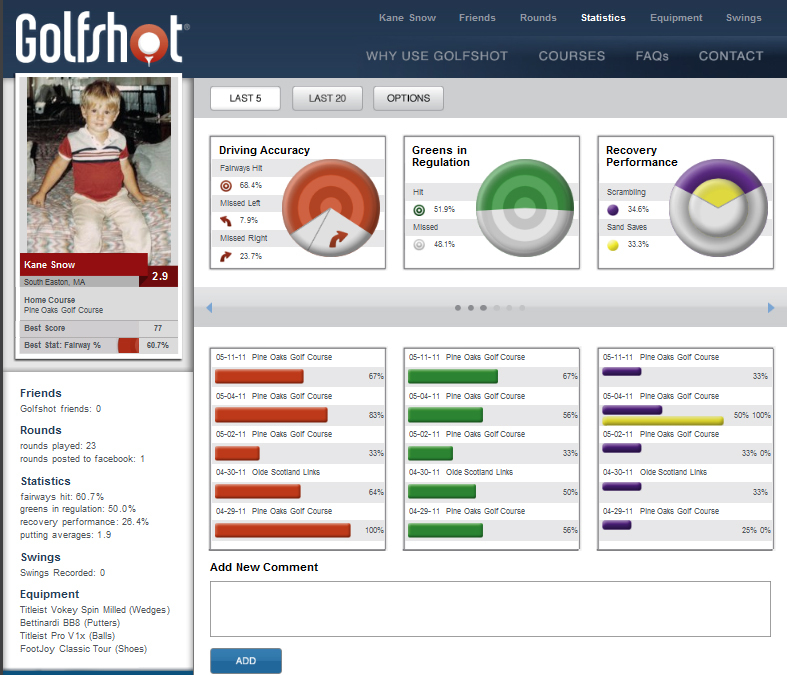 There is also a page dedicated to showing the courses that GolfShot has mapped, which is A LOT. I am sure there is a lot of information that could be added to these pages that would help improve them, but overall they give you everything you need, probably more. Overall I can say that I am very happy with this purchase. Sure there are plenty of times when I still check sprinkler heads or wish I had a rangefinder, but for the most part this app does everything I need and then some. The statistics and score tracking were both pleasant surprises. 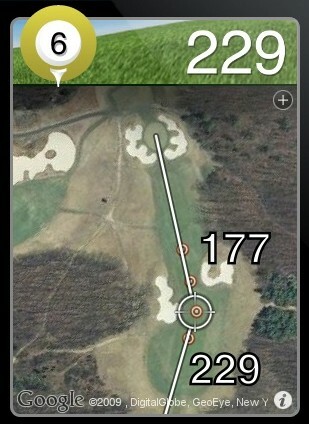 I might also add that the app GolfShot GPS LITE is free. It only does the statistics and scores, no GPS. I’d say this app is worth the $30. There are plenty of benefits to owning a dedicated GPS like a SkyCaddie or a rangefinder. These happen to typically be more expensive than $30, but they are also more reliable (won’t have any bugs like all apps are susceptible to) and don’t rely on your cell phone to be used. The accuracy of a dedicated GPS or rangefinder will also be better. Whatever you decide to go with, get out there and put it to use and enjoy this great game as much as possible.